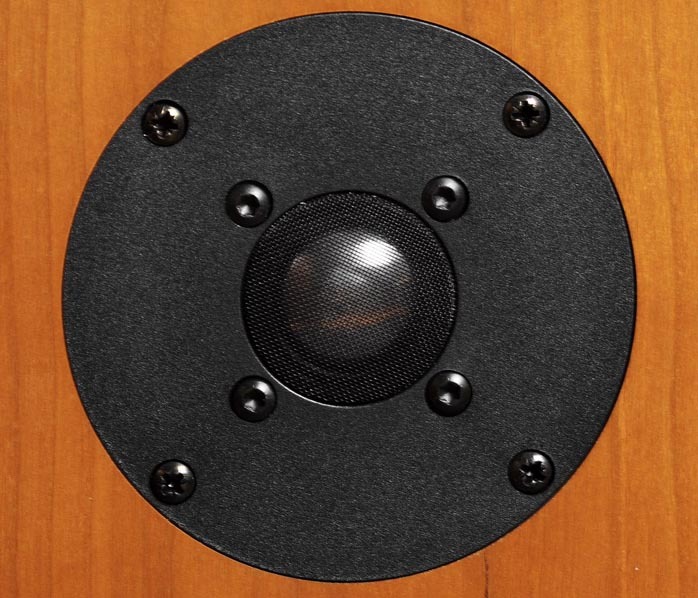 Nominally, the Harbeth Super HL5 is a stand-mounted three-way bass-reflex construction. This sounds similar to the majority of loudspeakers tested but a single glance suffices to remind us that we deal with something quite different here. This is a very big box whose dimensions are utterly out of step with modern times. I mentioned earlier that its volume was adopted by the BBC as a 'golden means' of two cubic feet and that its dimensions are homage to the first monitor made by that company. Neither is completely true as the dimensions of 322 x 638 x 300mm diverge just a bit from the classic 300 x 600 x 300mm of the BC-1 - not by much but still. 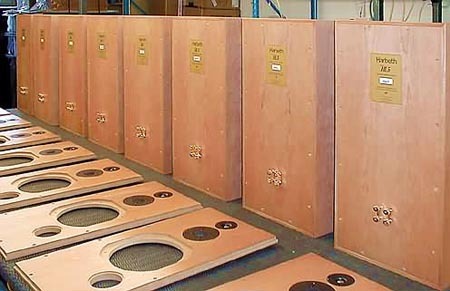 The loudspeakers require special low stands because they are very tall. Despite this they are very attractive. And perhaps it's their cosmetic conservativeness that makes them so. I can't be certain but find them extremely intriguing. This impression is amplified by a nice natural veneer on very thin MDF walls. The loudspeakers are paired so their frequency response matches in a +/- 3dB window. We also get a very well written comprehensive user manual but it's a pity that it only comes in English. 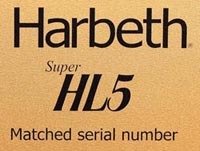 The Super HL5s are three-way speakers. On the front baffle we have three transducers, starting from the top with a 20mm titanium super tweeter with a neodymium magnet which begins working upward of 10kHz to remain in the audible range. Below that sits a 25mm aluminum SEAS tweeter similar to the one in my Dobermann. 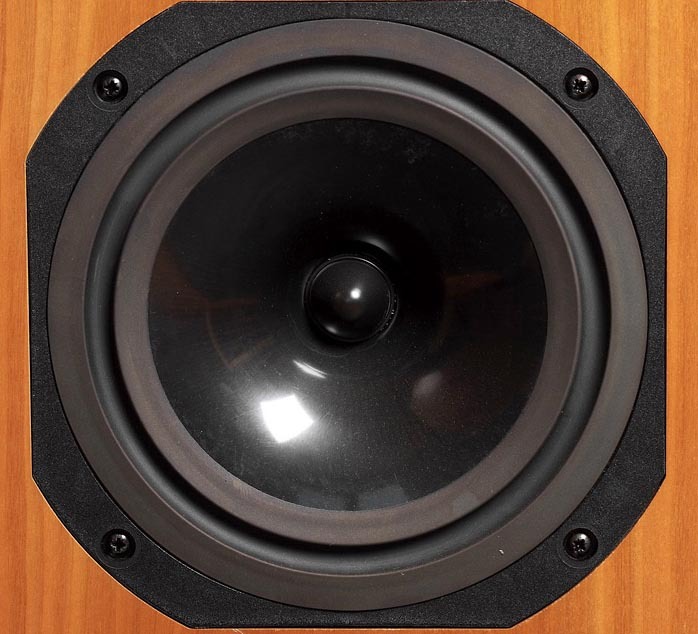 The lowest position is occupied by a 200mm mid/woofer made from a plastic called Radial. Its center is occupied by a phase corrector. The basket is very solidly cast. The front baffle is affixed with screws as is the back plate. Below the woofer sits the bass-reflex port. According to Hi-Fi Choice it is tuned to 35Hz, i.e. much lower than the driver's 55Hz resonant frequency. On the back we have quite ordinary biwire terminals screwed directly to the back plate. The crossover is mounted on a single PCB where we find many core coils, foil capacitors and resistors. The hookup wires are not very thick. The grilles are spanned over a metal frame that inserts into a notch on the sides of the front baffle. The speakers have a higher efficiency than the Dobermann, meaning their stated 86dB value is actually underspec'd but they are not very easy to drive. I would not place them too close to the walls as the nasality of vocals gets underlined and the whole presentation turns heavier which they don't need. Harbeth talks about 75cm distances but I think 1 meter is still on the low side.